and to feed a homeless person. 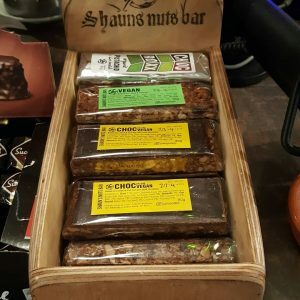 Govinda contacted Shaun Clohessy, who produces nut bars, granola, raw cakes and more in Newington Green, and Shaun was happy to share the recipe to AMURT UK for them to reproduce the bar for distribution to the homeless. At the end of May AMURT UK volunteers will be trained how to prepare the nut bars. Govinda with the help of artist Michelle Charles both designed a card which includes the details of the feeding programme, which is to be placed inside the bar’s packaging. Here’s a project to share healthy food, advertise both a local healthy food business (in Hackney) and the Thursday feeding programme in Holborn.